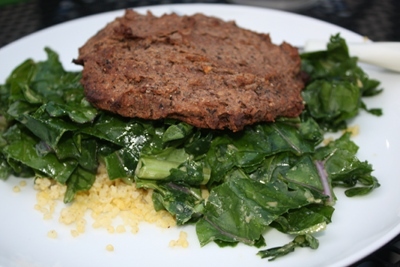 This black bean burgers recipe is one of the easiest recipes on the planet. The only work it requires is you locating items in your kitchen, tossing them in a blender, forming the mixture into patties, and putting them on a baking sheet to go in the oven for 15ish minutes. This is a fabulous veggie burger recipe when you've had a long day and want something healthy and quick, and they are really delicious. You can eat it in a variety of ways. I tend to be less of a buns-and-ketchup type, so I usually serve these as patties atop whole grains with plenty of vegetables. But, they end up being very sturdy burgers that won't break apart, so they're perfect as a typical veggie burger. I would even venture to say that you could put it on a grill once it's mostly cooked to give it grill marks and a bit of grill flavor, if you were very gentle with them. I think one of the reasons these black bean burgers stay together so well is because I grind them down until they are a sticky mess, which binds them together. A lot of veggie burgers are made with chunks of food and it's much easier for those to fall apart. So, it's crucial you give it a good blend to activate that stickiness. I use my Vitamix for this type of job because it pummels through anything and everything and then it's really easy to clean. You could use a food processor instead. This is also a very inexpensive recipe and it could be doubled, tripled, or quadrupled for a bigger family, or for storing burgers for later use. I love to make doubles of things like this so I can expend less energy on a dinner in the future. If you have kids, this gives them food they can pull out of the freezer that isn't processed or made with a bunch of unpronounceable words. If you're getting ready to have kids, making food and freezing is one of your best tools against the fatigue war you're about to face. You have two options for freezing burgers for later. #1. First of all, you could freeze the patties uncooked. The advantage here is that the burgers will have to be freshly cooked when you take them out later, and you might prefer that flavor. The best way to do this would be to form the patties and place them on a cookie sheet lined with waxed paper. Flash freeze them until they are rock hard and then remove them from the original waxed paper and wrap each one individually in new waxed paper and then place them all in a freezer bag. Don't forget to mark them with the date and plan to eat them within about 3 months. #2. The second option is to precook the black bean burgers. You will still want to flash freeze them and then wrap them individually. The advantage here is that you can take them out of the freezer and reheat to eat much quicker than with option one. Preheat the oven to 400 degrees and prepare a baking sheet with a bit of olive oil on it, and set aside. 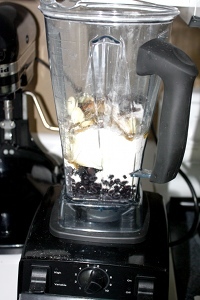 Load all the ingredients into your blender or food processor and whirl for about 30 seconds, tampering down anything that sticks at the top, until the mixture is totally combined and there are no pieces of onion left over. Taste the mixture to see if you like the spice level and adjust if you prefer more. Remember that you can always add more salt or spices into a recipe, but you can't take them out, so start on the lower end of measurements. This next step is messy, so beware. If your hands are wet or have olive oil on them, it will be much easier to form the patties. 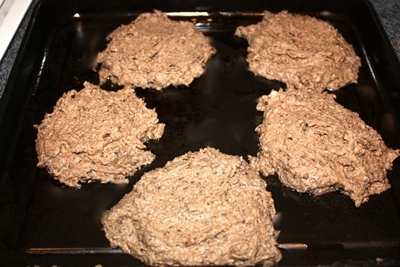 Form the black bean burger mixture into patties. You can make larger patties about the size of your fist, and you should end up with 5-6, or you can form smaller ones and get about 8 from the recipe. Don't freak out at this stage; the burgers are going to be very soupy looking and you'll doubt they'll even come together, let alone stick together, but I promise they will. Arrange the black bean burgers on the baking sheet so none of the edges touch and bake for about 15 minutes, until the patties are firm and set on the outside and the edges are slightly brown. Instead of baking, you could pan fry these burgers. I just prefer the texture when they're baked because they get crispy on the outside and they become fluffy on the inside. If you wanted to grill them at the end, I would bake them until they are just set, about 13 minutes. Then, gently take them off the baking sheet and transfer them to a grill for 1-2 minutes on each side. 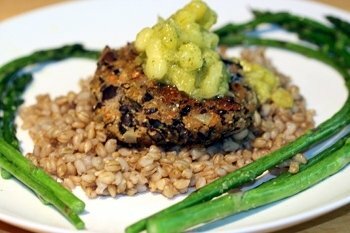 Then, enjoy either as a black bean burgers patty or as a burger dressed in all the fixins! This recipe has an affiliate link for Vitamix, which means that if you buy through this link you can save a little bit of money and you help support me running this site.